This is good advice. I have yet to land a real writing gig, but thinking on it I simply don’t have the experience. I can use this advice a great deal. Thank you very much. Great advice as always Carson. I have never understood why some writers do not see the value in having their own site. Not just a site, but a blog, where they can express themselves, demonstrate knowledge and the ability to be professional, and of course, show off their skills. I got my start with Demand Media Studios about 2 years ago. Technically I’m still a writer for them, even though I barely ever even log in anymore. -You get paid to produce writing samples. -When you apply for other gigs, you actually have a semi-reputable place to send potential “employers” to read your stuff. -The editors there are seriously the most picky I’ve ever dealt with. 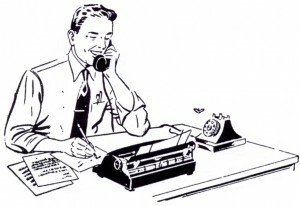 And I write copy, press releases, and SEO articles for LOTS of companies. So yeah, it gets old when various editors have different expectations. -$15 an article isn’t a ton of money. But it’s also better than $0 an article. Wow, this comment is almost an entire blog post itself. Maybe I should have posted this on my blog instead, haha. Another excellent post Carson. While I still think that rev-share sites have merit (and value) for new writers who are developing their skills these are some good “next step” options to consider. I don’t know about “taking a crappy writing job or two”. Working for someone on Craigslist who wants to pay you $3 for 10 500-word articles (“which should only take about half an hour to write, max,” as they usually post) will probably not give you any experience with professional invoicing and client communication, and will probably not result in anything you want for your portfolio. When I began branching into copywriting, I cut my rates (my own fault) to ensure a local partner would work with me. Yes, he swung me quite a few gigs and I ended up with clips for my website, but the reputation I ended up getting locally was as a fantastic copywriter who would work for peanuts. I am still trying to transition out of the rep I gave myself with that strategy. Building your own website is a great idea. Instead of crap Craigslist jobs, however, I would volunteer to write for a charitable organization or friends or family who have small businesses. It definitely won’t pay or won’t pay much, but it’s more likely to result in something you’d be proud to put your name on. Plus, you can practice your admin skills — I did a walk through of all my accounting software and admin practices with charity/family/friend clients, giving them a heavy discount/promo price on the final line. This is an excellent article. I’m already researching starting a website or blog using WordPress. I’m new at this — which is better, a website or blog? Once again, your rev-share nay sayers don’t offer any PROOF as to why it doesn’t work. Do we have to harp on you guys every time you claim it doesn’t work? I make $80 per month on AC and write one, maybe TWO articles a month. This is actually a very common income on AC. Instead of just blowing off websites for sucking, why don’t you actually interview the people who actually do well on these websites to find out their tips and secrets for succeeding? That would be a such a helpful, insightful article…unlike your article which is more full of fluff and boring, long, passive paragraphs. Oh, and I didn’t come here to read Carol Tice 2.0, I came here to read good content. It’s really, really sad that you’ve degraded Deb Ng’s wonderful website to this inane drivel. This article contained few facts, few statistics, but a lot of fluff I can’t imagine Ng in her prime would ever, ever publish. It’s really sad. But I’m sure you don’t care because you’re getting your pageviews anyway. Thanks for the alternatives list. There are some that can work for me, and some that can’t work for me. Firstly, after reading the other article, I tried to think up some other ways than revshare sites. Luckily, the one possibility I thought of was first on this list. Though my website makes me no money (Blog.com puts advertisements on it), according to what you say, it’ll build my web presence, which is what I’m searching for in the early years of my career (basically until I’m 16~18). About the low-paying jobs. I’ve been searching a bit, not on Craigslist, but after I post this comment, I suppose I’ll search there, for jobs that don’t necessarily require anything. All of the jobs that seem relevant to me, and things I can do (and pay quite low, by the way) still require 3+ samples + a resume, which is initially why I wanted to go to revshare sites. So, if you could clear this up with me, I’d be thankful. Lastly, where can you find volunteer opportunities? I’d love to volunteer to get my name out, but there is an inability to find anything other than posting on my own website. This was so unorganized, but I’m trying to put down everything I have to say without losing my thoughts, I apologize. Hi Carson, Great alternatives as deviation from rev share writing. I’ve not only been thinking about this seriously the recent past months, but slowly, trying to work on it… see how it goes. Thanks!